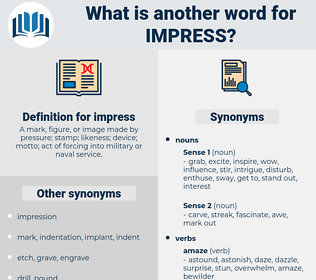 What is another word for impress? A mark, figure, or image made by pressure; stamp; likeness; device; motto; act of forcing into military or naval service. 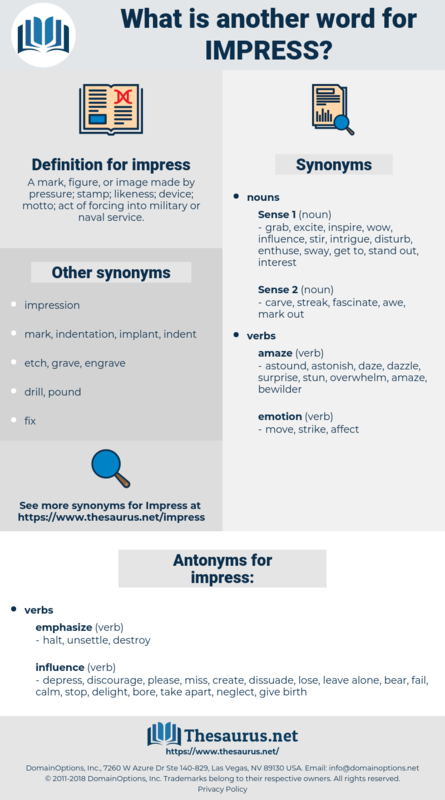 forwarding, convince, persuade, inculcate, emphasise, sensitize, emphasize, understand, instil, remind, convey, instill, educate, communicate, sensitise, stress, reassure, imbue, intimidate, highlight, underline, raise, comprehend. depress, discourage, please, miss, create, dissuade, lose, leave alone, bear, fail, calm, stop, delight, bore, take apart, neglect, give birth. I don't know that it is my business to go into that question; but one or two of the efforts you have made lately would scarcely impress the fact on me. How did this enthusiasm impress me? zap, strike a chord, sadden, stir, impress, alienate, jar, strike dumb, smite, engrave, sweep away, sweep off, move, wow, instill, surprise, disturb, awaken, hit home, prepossess, touch, upset, strike home, pierce, trouble, cloud, strike a note, infect, ingrain.